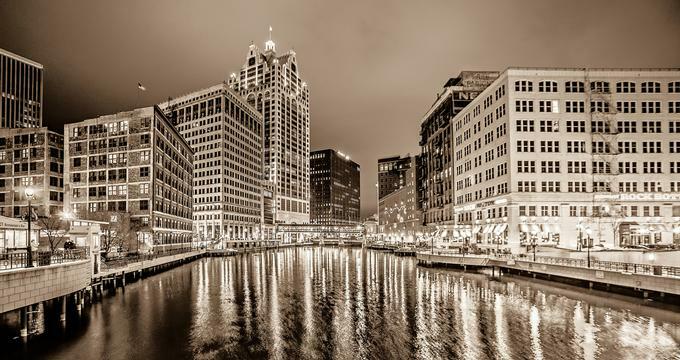 The Historic Third Ward is Milwaukee, Wisconsin’s premier spot for art, retail, and fashion. Visitors will find fine dining, spas, art galleries, unique boutiques, and theaters, most within walking distance of each other in the historic warehouse district. The Third Ward is the oldest center of commerce and warehousing in Milwaukee and is listed on the National Register of Historic Places as such. After the devastating fire of 1892 that destroyed a 16-block area of the riverfront commerce section resulting in $60 million worth of damage by today’s standards, the district was rebuilt into a booming commercial market over the course of 30 years. The Historic Third Ward Association was established in 1976 to work with those who live in the neighborhood, business owners and merchants, real-estate developers, organizations, and community leadership to further develop, plan, and revitalize the Third Ward. They also promote events, foster develop and positive business relationships, and recruit new business to the area. The Third Ward proudly employs over 5,000 people all within a 60-block radius. Presently, the Third Ward is a mixed-use neighborhood with over 500 businesses including award winning restaurants, the most art galleries of anywhere in Milwaukee, specialty shops, the Broadway Theater Company, art galleries, advertising agencies, architectural firms, condominiums, offices, and industrial spaces as well as many other artistic and business endeavors. Since 2004, the Third Ward has seen an expansion in its retail offerings for upscale women’s and children’s boutiques, home furnishings, and other high-end merchandise. The Milwaukee Public Market opened in 2005 which drew over one million people in 2012. The Historic Third Ward also draws numerous crowds to the Henry W. Maier Festival Park where Summerfest and other festivals which attract over 2 million visitors annually and the Italian Community Center which can bring crowds of up to half a million easily. The Third Ward continues to grow in its residential offerings as well with over 1200 condominiums being completed as of 2011. The Third Ward is known for its eclectic shopping options that suit every taste and budget. They offer Fashion and Accessory shops that offer affordable trendy jewelry, unique handbags, scarves, hair accessories, wallets, purses, and more. Some shops are locally owned while others are national chains such as Anthropologie, Lululemon, MODA3, and others. Visitors can also find shops that specialize in healthcare services, home and office furnishings, interior design and specialty shopping. Some of the most noteworthy shops include The Home Market, Luminosity, Inc, Broadway Paper, Window Vogue and Inspired. There is no shortage of places to relax, eat, or enjoy a drink in The Historic Third Ward. From Cafés, coffee shops, chocolatiers, bakeries, award winning restaurants, sustainable food sourced locally, to pubs, taverns, and bars; as well as the many establishments, available at the Public Market, everyone is sure to find something to satisfy their taste buds in The Third Ward. Food Tours are also available through Milwaukee Food & City Tours that takes participants behind the scenes to some of the best eateries in the Third Ward. Tours include a full meal that is divided up into tastings at a minimum of four different restaurants with drink samples, stories on Milwaukee’s rich history, and a fun time had by all over 2.5-3 hours. One of the most beloved treasures of The Third Ward is the accessibility to the arts. There are a plethora of art galleries and museums that can be frequented including The Harley-Davidson Museum, several independent art studios and galleries, Milwaukee Artist Resource Center, Edelman Studios LLC, and many more. Performing arts are also at the forefront of the Third Ward and The Broadway Theatre Center is one of the most recognizable features. The Fred Astaire Dance Studio, Milwaukee World Festival Inc, Skylight Music Theatre, Trinity Academy of Irish Dance, and Renaissance Theatreworks, can all be found here. Although there may be several events that happen spontaneously throughout the calendar year, there are a few annual events that visitors to the Third Ward can look forward to. Gallery Night and Day- This events happens 4 weekends each year and showcases the artistic talent of the Third Ward. Sidewalk Sale- End of summer sale where over 30 local merchants feature amazing discounts and bargains! Third Ward Art Festival- Every Labor Day weekend the Third Ward features a renowned display of art from every medium that is for sale by local and national artists. Small Business Saturday- Support your locally owned shops in the Third Ward the Saturday before Thanksgiving when many merchants are offering incentives for shopping small and local. Christmas in the Ward- The annual Christmas festival kicks off the holiday season every first weekend in December with fireworks, visits from Santa and his reindeer along with other festivities.